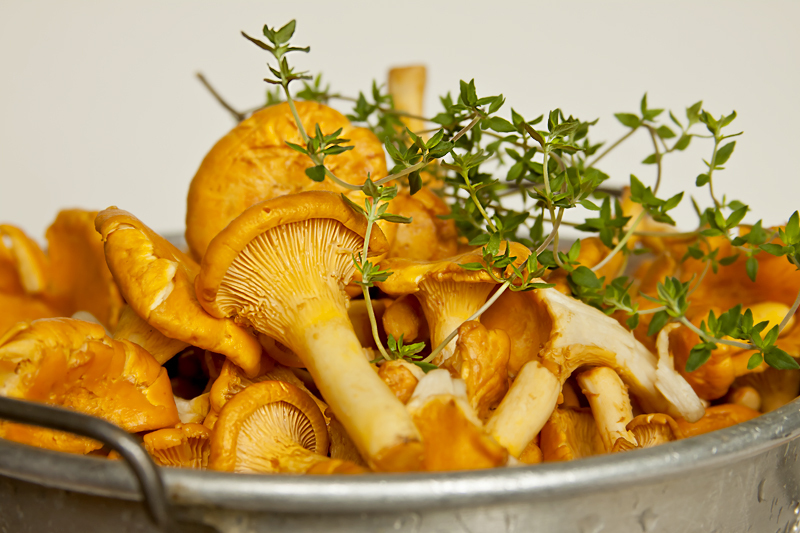 The deep intense flavor of wild mushrooms is something that cultivated mushrooms just don’t have. I’m talking about real wild mushrooms, not the kind typically found in grocery stores and on too many restaurant menus. Wild mushrooms grow in the wild. They grow in forests, on mountainsides, in meadows and in deep brush. They grow whenever and wherever their nature tells them to grow, and their marvelous earthy flavors are a sure sign that they are NOT the safe little farm-raised tasteless buttons you find in cans or in the grocer’s cooler. While I prefer fresh chanterelles in this recipe, you can use any combination of fresh wild mushrooms. If you absolutely cannot find or buy wild mushrooms, by all means, use good quality cultivated mushrooms like shiitake, oyster or cremini mushrooms. Just keep in mind that cultivated mushrooms will not have the intense, earthy aroma of wild mushrooms, so I strongly urge you to consider adding wild mushrooms of some sort to the mix. 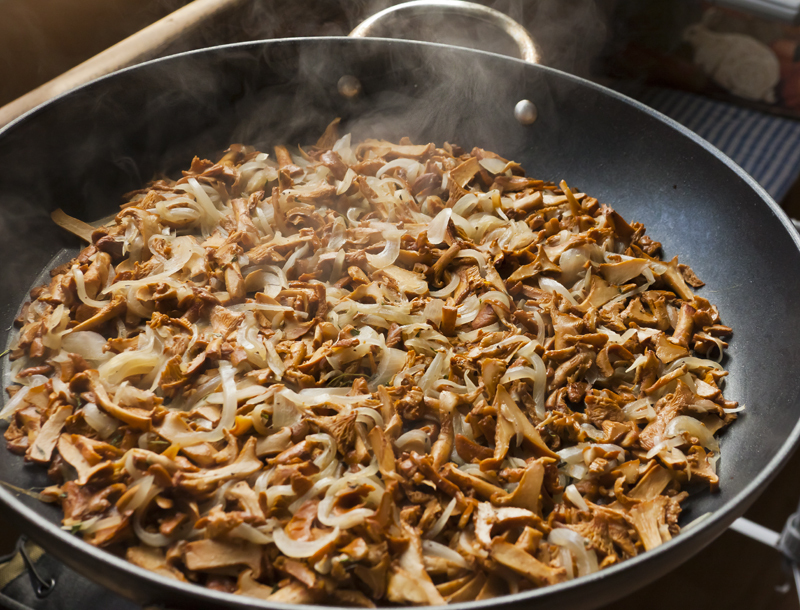 Even if you don’t have access to fresh wild mushroom, you can substitute reconstituted dried mushrooms as part of your mushroom blend for some genuine, intense wild mushroom flavor. While this rustic, free-form tart is wonderful when eaten straight from the oven, its remarkable, mouthwatering flavor actually improves and intensifies after it rests for a day or two. By then, the entire tart – filling, crust & all – has become infused with the amazing flavor and aroma of the chanterelle mushrooms. I especially like the way the bechamel sauce helps to gently marry the taste and texture of mushrooms and pastry into one intoxicating union of earthy goodness. 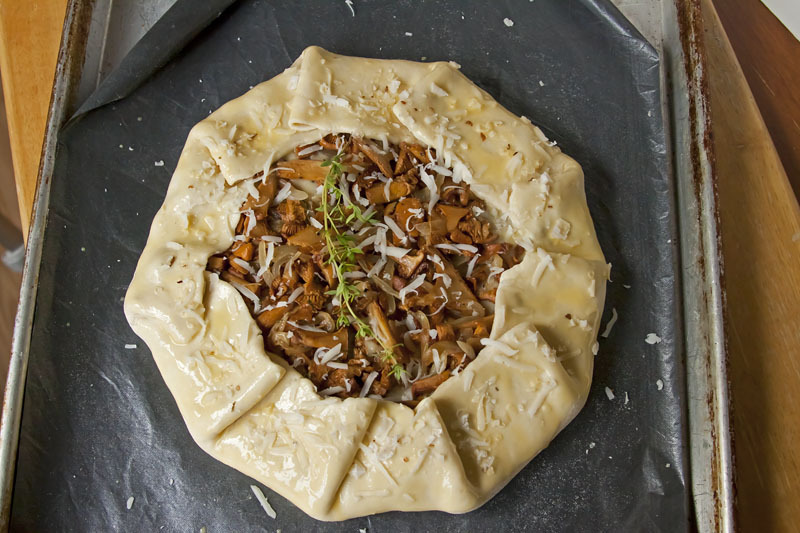 Serve this rustic wild mushroom tart with a salad and a glass of chilled white or rose wine or an ice-cold summer ale for a light summer lunch or dinner. It’s not only easy to make & serve, it’s a delicious and rewarding meal that is altogether satisfying in every way. 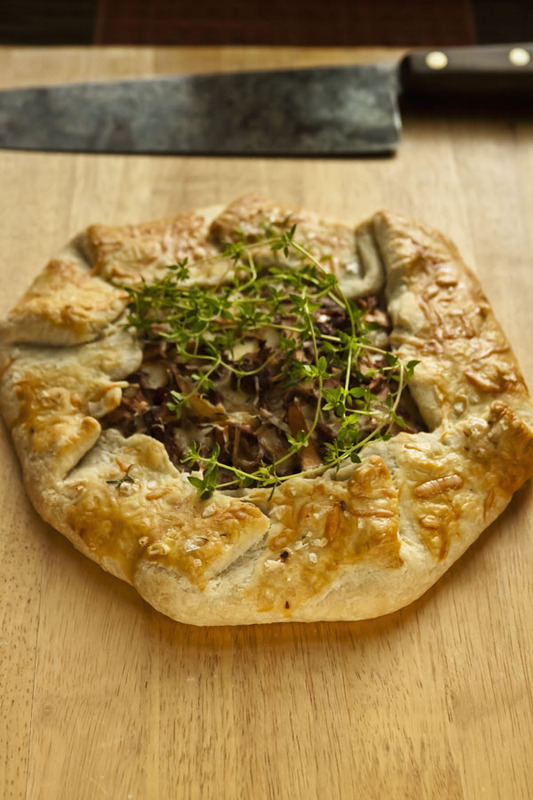 This mushroom tart is composed of three components which are prepared separately: the wild mushroom filling, the Béchamel sauce and the savory dough. Each can be prepared ahead of time and the tart can be easily assembled just before baking. If you like, you can double the dough recipe and freeze half for future use. The dough freezes beautifully for up to six months. Prepare the Savory Tart Dough and Béchamel sauce in advance. Chill the dough for at least one hour. Preheat the oven to 400F. Heat a large skillet over medium high heat & add the olive oil. Add the mushrooms and onions and cook for about 10 minutes, stirring frequently. Add the thyme leaves and continue to cook until almost all the liquid has evaporated and the bottom of the skillet is dry. Add salt & pepper to taste, remove from the heat and set aside. Roll each disc of dough into circles about 10 inches in diameter. The crust should be about 1/8″ thick. Place 1/3 of the filling in the middle of each circle. Leave a border of about 2 inches around the outside of the crust. Spoon half of the bechamel sauce over the mushrooms. 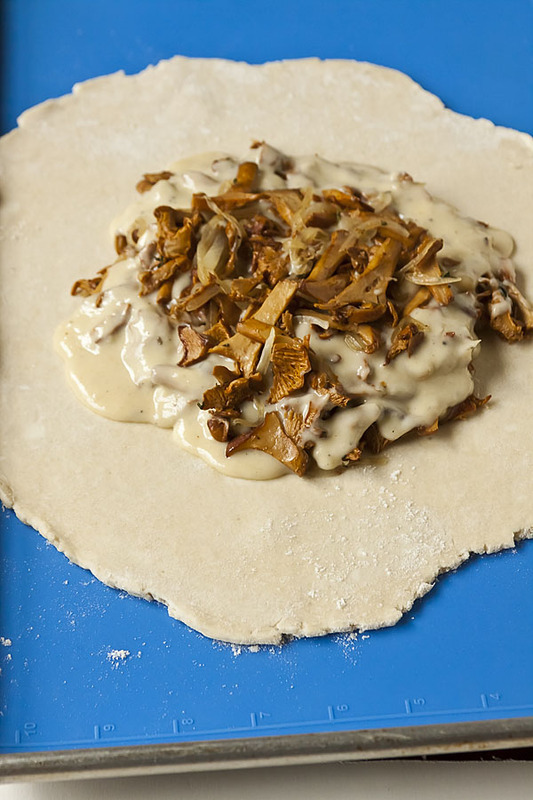 Top with half of the remaining mushroom mixture and neatly fold the edges of the crust over into loose “pleats.” Lightly brush the pleated edges of the dough with the eggwash and sprinkle each tart with 1 Tbsp coarsely grated cheese and 1 tsp coarse salt. Place the tarts on a lightly oiled baking sheet. Bake for about 20 to 25 minutes or until each galette is golden brown. Remove from the oven, allow to cool slightly and garnish with a sprig of fresh thyme before slicing and serving. Melt the butter over medium low heat in a saucepan. Whisk in the flour until completely incorporated. Continue whisking over medium low while the butter & flour mixture bubbles, about 3 minutes. This is known as a roux (pronounced “roo”). Heat the milk until hot, but not boiling. Pour the hot milk, a little at a time, into the roux while whisking continually. The mixture will quickly begin to thicken. Reduce the heat to low and continue to whisk until the sauce is thickened and smooth. Mix in the grated cheese (reserving 2 Tbsp for later use), bit by bit, until completely incorporated. Season with salt & pepper to taste and remove from the heat. Whisk a little of the hot sauce (a couple of tablespoons) into the beaten egg to temper it. Then whisk the egg mixture into the sauce and set aside. In a large bowl, mix together the flour, sugar and salt. Place into a food processor with the chilled butter. Pulse until the butter is evenly distributed but still in pea-sized pieces. Add the ice water all at once to the flour and butter. Pulse again until the dough just comes together into a mass  do not overmix. Using your hands, divide the dough evenly in half and mold into slightly flattened disks. Wrap the disks in plastic and refrigerate for at least 1 hour. Amazing! a mushroom turned tart. I bet that taste delectable and can’t wait to try some of it. I live in Oregon, need I say more! Chanterelles ROCK! And so does this recipe. Can’t wait to try it. I can imagine the sweet aroma while you were preparing this dish. Looks really tasty. Love the photo. This looks amazing. I absolutely love mushrooms and savory dishes. So beautiful. This recipe is GREAT! I made it with local wild Adirondack hedgehog mushrooms, trumpet chanterelles, and honey mushrooms. Earthy, savory, delectable. Thank you! P.S. I modified the sauce and pastry with gluten-free ingredients. Easy. This is a fantastic recipe. Just finished picking fresh chanterelle mushroom from the Waldport area, probably got about 40 pounds or so. I will be making this recipe again in a few days,,,,, Love chanterelle mushrooms and this time of the year for hunting them and storing them for winter use. Will try this for supper.Sounds wonderful and I do love mushrooms. I have made this tart so many times I can do it with my eyes closed. It is wonderful! Sometimes I add a very small amount of venison or spicy sausage. The venison is very good with the chanterelles. Since I am not a Swiss cheese fan I use 5 Italian cheeses blend. I also make a version using Chicken of the Woods (sulpher shelf) mushroom and use chicken fajita seasoning and pepper jack cheese. I have made it with dryad saddles and oyster mushrooms and also made a gluten free version. It never fails to please. If serving it the next day do you reheat it or serve at room temperature? This mushroom tart is equally delicious served at room temperature or reheated uncovered in a moderate oven for 15 minutes or until heated through. Delicious tart, I made the béchamel with a sharp cheddar and it was lovely. I did find the ratio of onions to chanterelles very heavy on the onions once everything was sautéed. Next time I will only use 1 onion. Other than that, it was great! We’re glad to hear that you enjoyed the recipe – and that you are ready to modify it to suit your personal preferences next time. The recipe is a guide and experimentation is what good cooking is all about. Bon appetit! I made this with Chicken of the Woods, which was not the best mushroom choice, as COW are high in protein but not especially flavorful. I added some steamed spinach. If I make it with this ‘shroom again, I’d add some sherry to the sauce and perhaps a bit of lemon juice and zest on top (or also in the sauce). Thanks for the great idea! I’ll try again with different shrooms. Made this recipe this morning and it tasted great. Thank you.